Vigorous, colorful, bold and highly personal, Breaking New Ground is the autobiography of Gifford Pinchot, founder and first chief of the Forest Service. He tells a fascinating tale of his efforts, under President Theodore Roosevelt, to wrest the forests from economic special interests and to bring them under management for multiple- and long-range use. His philosophy of "the greatest good for the greatest number over the longest time" has become the foundation upon which this country's conservation policy is based. 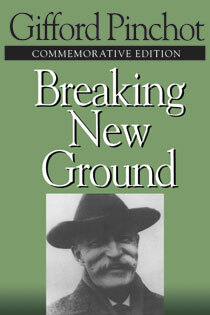 In a new introduction for this special commemorative edition, Char Miller of Trinity University and V. Alaric Sample of the Pinchot Institute for Conservation trace the evolution of Gifford Pinchot's career in the context of his personal life and the social and environmental issues of his time. They illuminate the courage and vision of the man whose leadership is central to the development of the profession of forestry in the United States. Breaking New Ground is essential reading for anyone interested in understanding the basis of our present national forest policy, and the origins of the conservation movement. Chapter 3. The Brandis Excursion.